The North East wedding band Funk Conspiracy has provided first class live entertainment for hundreds of events in the North East as well as further afield. The band has a long list of satisfied customers, from happy couples to high profile companies. "We had such a wonderful wedding day. The band were absolutely fantastic - very happy to play our first dance song for us, and then they really got the whole party going - the dance floor was absolutely packed. The lead singer was wonderful and had great banter with the crowd, which went down really well. The songs were great fun, and we have had so much good feedback since the event, with several people saying that Funk Conspiracy are the best band they've ever seen at a wedding. We would definitely recommend the band to everybody, and hope to see them playing again soon! We would definitely recommend the band to anyone. Please do pass on our enormous thanks to everyone who played on the evening, it was massively appreciated. Thanks again!" Sarah and Mark Dixon from an email regarding their wedding reception. "The band were excellent and i would not hesitate to recommend them to anyone. Thanks once again." Sarah Dunbar regarding her daughter's wedding reception. "Thank you so much for providing fabulous music for our wedding party. So many guests complimented the music - they even mentioned it in our guest book. The dance floor was busy all night. We would definitely recommend you to friends and family and would book you again if we had another party." Philippa and John Bell from an email regarding their wedding reception. "The band were fantastic - we were so impressed with the quality of the music but we'd obviously heard tracks from the website so we kind of knew what to expect. And they didn't disappoint! The dancefloor was busy the whole night, which is a great testament, and lots of people were asking where we'd found the band. Thank you so much to you and the band for doing such an amazing job!" Jon & Hannah Coffey from an email regarding their wedding reception. Jo and Andrew Lambert from an email regarding their wedding reception. "I thought the band were amazing, so did my guests. I think they may even get a couple of bookings out of it. I was 25 weeks pregnant at my wedding (where Funk Conspiracy also played) and was exhausted by the night time so didn’t really get to enjoy the band as much as I would have liked. This time though, well what can I say I loved it and danced my socks off. Just want to say a huge thank you and look forward to seeing them again no doubt." Carole Crowe from an email regarding her husband's 40th birthday party. "Thanks for making the wedding evening such a great occasion. You filled the floor straight away and no-one left till the end! I already knew you were brilliant from hearing you many times before and it was great to hear so many people find out how great you are. It sounds like you'll be invited to play at many other friend's wedding in future! Thank you also for letting me play the one song with you guys. I have heard that a group of about 6 people who heard you that night were so inspired that they've now promptly formed their own band! Thanks again - Katie and I loved it, and look forward to hearing you again in future (if I'm allowed to play Sir Duke again or some other tune I won't turn it down!)" Katie and Andy Hills from an email regarding their wedding reception. "Thank you so much for performing at our wedding! you guys were great and we had such a fun night :) Everyone is always saying what fun they had and what an amazing band you all were and it made the whole night have a real party feeling... we'll be teasing 'Auntie Julie' and 'Uncle Steve' for years to come too so that's an added bonus!" 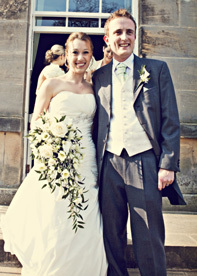 Emma and Ollie York, from an email regarding their wedding reception. "Thank you so much for making my mum's 50th birthday party so special. You played something for everyone and people couldn't help but get up and dance! We had so many compliments about the set and a few guests have even asked for your details to book you for their upcoming events. I wouldn't have to think twice about booking again!" Kate Ingram from an email regarding her mother's surprise 50th birthday party. "Thanks so much for playing for us last night. We really enjoyed ourselves and loved your sound. Loads of people paid compliments to you - hopefully you may get further bookings. Hope you enjoyed yourselves too. Thanks again, you made the night a very special one to remember." Kate and Paul Carding from an email regarding their birthday party. "Thanks so much to you all for playing last night. I thought the music was fantastic and lots of people commented about how great you were. A member of our congregation had you at their wedding last year and you're also playing at another upcoming wedding, so word of mouth is definitely working for you!" Anna Reppold from an email regarding the Jesmond Parish Church Ball. "The band were great! We had a lot of feed back from the guests that they were impressed with yourselves. I certainly was impressed how full the dance floor was especially at the very end of each set, there was no room for any more! it really gave a fun and happy atmosphere to the night. " Gemma and Matthew Molyneux from an email regarding their wedding reception. "We just want to thank you so much for making our wedding night so special. You exceeded all expectations and we received numerous comments on how great you were, you certainly made it a night to remember! Thanks so much again and best wishes to you all for Christmas and the New Year, we will most definately come and see you play again!" Sarah and Andrew Perkins from an email regarding their wedding reception. "We were very happy with the band for our wedding day. Our guests really loved the guys and the songs worked really well for our day. Your lead singer was a real hit with everyone! Thank You!" Helen and Henry Cutmore from an email regarding their wedding reseption. "The band was phenomenally good; they put their hearts and souls into the music! The sets played were excellent; everyone was up getting their ‘groove on’! Zita’s voice is soulful and beautifully accompanied by four fantastic musicians. Everyone commented on how good you were, ‘best band we’ve heard at a wedding’ was common and I believe you even had requests for CDs... Particular thanks to Nicky – my granddad was an incredible drummer in his day and Nicky’s solo brought big smiles to many faces. " Scott and Rachel Barclay from an email regarding their wedding reception. "Thank you so much for performing at our wedding, it made the night for everyone! The atmosphere was great and your music certainly got everyone in the party mood! The schedule for our day was pretty tight so we really appreciate how quickly you got set up. All in all we could not be happier and its the best money we ever spent! We will certainly recommend you to all of our friends when they decide to take the plunge and get married!" Helen and Darren Ord from an email regarding their wedding reception. "Just to let you know the band went down a storm at our wedding and we'd also like to thank you for organising the 'swing section' - it was much appreciated." Louise and Garry Miller from an email regarding their wedding reception. "Thanks so much for being so brilliant on our wedding day. The music was great and everyone commented on how much they loved it! The dance floor was certainly full all nigth. We had an amazing day and you all helped by being part of that. We hope you are well and please pass our best wishes to the rest of the band." Chris and Georgina Scott-Batey from a letter regarding their wedding reception. "Funk Conspiracy were awesome, we were so happy. All the guests commented on the high quality of the bands performance and everyone had a great evening. The set list was fantastic, good mixture of stuff and it appealed to everyone there. Even the die hard Scots who I only ever see dancing at Ceilidh's got involved - so that alone is some testament to the appeal of your music. We'd had such a great day and your music was the perfect end to it all. It was excellent value for money as well considering the quantity and quality of the musicians in the band. Please thank them all for us. I'll certainly recommend you guys to friends who are looking to book a band for their wedding." Nick and Louise Sinclair from an email regarding their wedding reception. "You were absolutely fantastic at our wedding. All our guests are still talking about you now! Our first dance was so much more special with you guys playing for us. And the dance floor was full all night. We would recommend you to everyone!!" Rachel and Neil Swinbank from an email regarding their wedding reception. "We would like to pass on the biggest thank you to the band! We were blown away by your performance, and we've lost count of how many of our guests said that you were fantastic! Paul did a brilliant job playing sax during the meal, the whole band were unbelievably good and the set was perfect for our range of guests. Zita was just brilliant, and so professional. You even did a great job organising our playlists for between your sets and after you finished! Funk Conspiracy really made our reception perfect,and we've got so many great memories, captured perfectly in the photo Zita took of us all on the dance floor!" Adam and Angela Clemerson from an email regarding their wedding reception. "The band were superb on our wedding night, the repertoire was ideal and we had more than a few comments from people complimenting them. Please pass my thanks to all the members of the band, they were all very friendly and i hope they enjoyed the night too. Thanks again!" Mark and Grace Dawson from an email regarding their wedding reception. "Thanks to you and the band for a fantastic evening. Everyone we've spoken to since the wedding has commented on how good the band were. We and our guests really loved the music, I think I danced all evening. We also had a couple of guests who sing professionally and they were green with envy. We'll certainly recommend you to family and friends. In fact, the owner of the venue asked us for your details which we passed on. She said you were the best band to ever play there. Many thanks again, we really enjoyed it." Emma and Graeme Gallagher from an email regarding their wedding reception. "Thanks again - you were extremely professional and you went down a storm! My particular highlight was the drum solo! Very impressive." Tom and Angela Hall from an email regarding their wedding reception. "The band was fantastic, we all had a great time and everyone commented on the excellent atmosphere. I think everybody was dancing, young and old, it was a shame the evening went so quickly." Richard and Julian from an email regarding their civil partnership reception. "Funk Conspiracy played at our wedding in the Radisson, Durham in July this year. Everybody had the most fab time ever and couldn't speak highly enough of how good the band were. Thanks again for making our special day even more so special!" Claire and David Higgins from an email regarding their wedding reception. "The musicians were great and played a wide selection of music in a polished and professional way. The singer was fantastic and I mean fantastic. They arrived on time and were polite and approachable. Thank you for your help and I am sure we will be using you in the future." David Forbes from an email regarding the Mechtool Engineering summer party. "Thank you for playing at our wedding and helping to make it so much fun. Everyone really enjoyed the music - from the one year olds to the seventy year olds!" Sarah and Nick Ireland from an email regarding their wedding reception. "The band were absolutely fantastic and had everyone up on the dance floor. We will definitely recommend you for future occasions." Andrew and Emma McCartney from an email regarding their wedding reception. "Just wanted to drop you a line again to say thanks. Your band were amazing and really helped round off a perfect day. Thank You." Alan and Emma Brown from an email regarding their wedding reception. "Many thanks playing such great music at the wedding, everyone was knocked out by your performance. Thanks again for contributing to an unforgettable day." Susan Earl, regarding her daughter's wedding reception. "We want to say an enormous thank you to Funk Conspiracy for being the final piece to our amazing wedding day jigsaw! I personally spent a lot of time looking for a good live band - and I came across many not so good ones before I discovered Funk Conspiracy. Believe me, the time and effort was more than worth it! They were utterly fabulous; Zita was on fire and the band was as tight as could be. All of our guests commented on how fantastic the music was, and our dancefloor was packed all night. If you are considering a live band for your wedding or event, you will not find a better funk and soul crew than this one! Thanks again guys for helping to make our wedding so memorable. You made everyone's night." Andy and Katy Charlton from an email regarding their wedding reception. "We had a fantastic time and the band were amazing, we had so many positive comments about you guys. Thanks so much you made our day even more special." Claire and Andrew Brown from an email regarding their wedding reception. "Both myself and other members of the Whitley Bay Round Table were absolutely delighted with the show you put on. We raised over £800 on the night for the charities and the feedback from many of the guests was that Funk Conspiracy were one of the best if not the best function bands they had seen at a dinner dance event, proved by how many people where up and dancing all the way through your set! From a personal point of view i'd like to thank you for such a professional service and the way in which your set and overall performance fitted in with the night perfectly, the songs were spot on for the theme of the night and i was thrilled that you even played over your original finish time and past 12 midnight. Could you please pass my rather belated thanks to all the members, we would love to have you play at one of our functions again and will be sure to get in touch with you sooner rather than later." Andre Wood from an email regarding his Round Table Charity event. "We were absolutely delighted with your performance and everyone we have spoken to has mentioned how great your performance was too! Thank you so much for making our day extra special and getting everyone on the dance floor!" Chris and Rebecca Williamson from an email regarding their wedding reception. "We booked funk conspiracy based on their great set list and smooth sounding audio clips; on the evening of our wedding they did not disappoint. They were quick to set up, professional and very keen to fit in with our plans and requests from our guests. Their performance was spotless and loads of our guests commented on how good they were. They really added to the party and had everyone on the dance floor. Thanks for a great evening!" Izzy and Jonny Clayton from an email regarding their wedding reception. "We were extremely happy with the band they were efficient friendly and very entertaining. I had a lot of good comments about the band and I have passed on your details to a few people I hope this helps you with future business. We had a fantastic night, couldn't be happier with the entertainment and we will certainly be using you in future events." Danielle Ailano and James Knox regarding their engagement party. "Just a quick note to say thank you for your performance. I absolutely loved our first dance and had a great time dancing to your set. So many of our guests commented on how fab they thought you were. Best wishes." Lindsey and Chris Palmer from an email regarding their wedding reception. "We all had a fabulous night and without exception everyone commented on the quality of the music. I'm fairly sure from the first song to the last the dancefloor was well populated! Considering the wide age group everyone managed to get on their feet which is exactly what we were hoping for. Three or four of our guests who are in bands themselves were particularly keen to mention the quality of the band members and the repertoire. Best wishes, I wouldn't hesitate to book you again or indeed to recommend you to anyone. Feel free to pass on my details if someone would like a personal reccomendation." Mark Laverick regarding his birthday party.